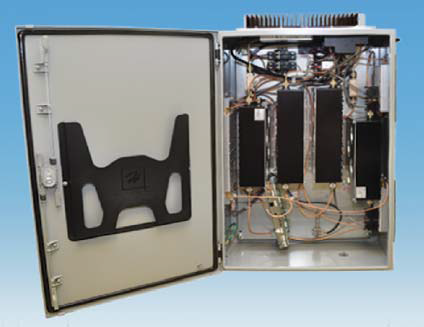 The 614 Series Digital Signal Booster is a TX RX system from Bird Technologies designed to operate in the UHF frequency band. Digital filters are available for both uplink and downlink, and are user programmable from 6.25 kHz to 1.5 MHz. Other filter center characteristics are fully programmable in order to meet various system and signal demands. The 614 Series has many features including Fast Fourier Transform (FFT) for viewing the current RF spectrum, oscillation detection and management, SNMP 3.0 for gathering system performance information, digital filtering capabilities, and local and remote access from any compatible PC. The signal booster provides public safety grade reliability and coverage in challenging RF environments. Other forms of system use include connecting to any number of broadband boosters, and minimizing noise and interference in RF congested areas. For more features and specifications on the 614 Series Digital Signal Booster, download the datasheet.